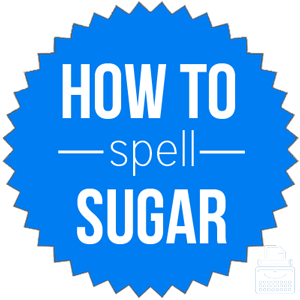 Spelling of Sugar: Sugar is spelled s-u-g-a-r. Definition of Sugar: Sugar is a sweet, crystalline material that consists wholly of sucrose. It is white or colorless when pure, but more of a brown color when less refined. Sugar is obtained from sugarcane or sugar beet, and other sources, though less commonly. It is a source of dietary carbohydrate and also a sweetener and preservative in other foods. Sugar also means to coat, sweeten, or cover with sugar. As well, sugar involves making something more appealing. Pronunciation of Sugar: Sugar is pronounced shu-ger. What does sugar mean? Sugar is a noun. It refers to the sweet, usually white, crystallizable substance used to sweeten and preserve beverages and other foods. My grandma’s batch of homemade pickles tasted awful because she mistakenly used salt instead of sugar. Sugar is occasionally used as a verb, but when it is, it is the act of making something more attractive or appealing, or, sprinkling or mixing with sugar. After the fruit is cleaned, it is then dried and sugared. While the donuts are still hot from the oil, sugar them and serve. As an intransitive verb, it also involves forming or converting into sugar or making maple syrup or sugar from sap. The family has been sugaring for generations. Sugar coat: (figuratively) to make more attractive, acceptable, or appealing than something really is; (literally) to coat an item in sugar. Sugar cube/lump: a portion of sugar in the shape of a cube. Sugar/sweeten the pill: to make something that is unpleasant less difficult to accept or manage. Sugar: a term of endearment usually used by couples as a pet name. According to Merriam-Webster’s, sugar was first used in the 14th century. Sugar comes from Middle English sugre, sucre from Anglo-French sucre, which comes from Medieval Latin zaccarum. The latter comes from Old Italian zucchero from Arabic sukkar from Persian shakar. Ultimately, the origins can be traced back to Sanskrit, sarkara, grit, ground sugar, which is related to Sanskrit sarkara pebble. There are a couple synonyms for sugar, though they are rarely used as they are scientific names for the pure substance. Sugar can function as a noun or a verb. Most commonly, sugar is used as a noun and refers to the white, crystalline substance used to sweeten and preserve other foods and beverages. The verb form usually involves making something sweeter or coating it with sugar.